The inability to image at home… or at least near home… is limiting my progress. I’m fairly patient, but getting out once a month is challenging. I am hungry to implement new knowledge I’ve learned through self-study and driving two to four hours a couple nights a month to hopefully practice is frustrating. Several weeks had gone by since my last imaging session out at Columbus and I hatched a plan at some point along that lull to “fix” my situation by accelerating my learning curve. I was going to leverage astronomy filters designed to attenuate certain wavelengths of light and allow the unhindered passage of other wavelengths of light in my imaging train. This is commonly called narrow-band imaging (NB). There was only one problem – no AP filters were made for my camera or lens. I even wrote the most prolific filter manufacturers asking for guidance and they confirmed my options were limited. My long term plan was always to move into some sort of dedicated imaging telescope with an array of filters and a cooled CCD camera. I knew that is where I was headed… eventually. 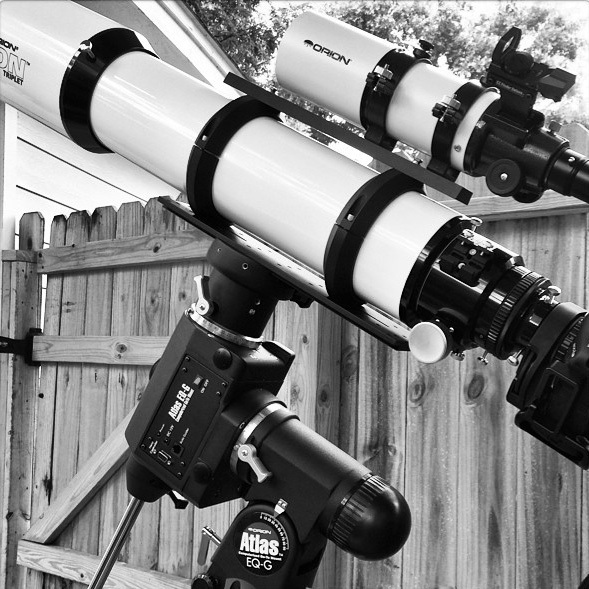 I didn’t think the telescope decision and purchase would be driven by the want for filters though… cart, horse, chicken, egg… this was happening. I elected to purchase a refractor because it was closest to what I was familiar with in the “normal” photographic world and I wouldn’t have to deal with mirrors, collimation, and to a lesser extent, cooldowns, right away. I opted for a triplet to minimize chromatic aberration and flatten the field a little bit. I also decided to stick with Orion due to their tremendous customer service. I didn’t realize at the time the can of worms I was opening up, but this is clearly one of the ways to learn this hobby. By doing. Previous PostGo West, young man.Next PostTunnel vision.